How can you resist a slice of this? Perfect if you are looking for a dessert you can whip up in no time. This is a recipe adapted from BBC Good Food Magazine. By adapted I mean I have adapted it to a gluten free version. Preheat oven to 160C. Prepare your baking tray by greasing the sides and bottom with butter. Set aside. I halved the recipe and used a tray 36cm x 12cm. Mix the flours and almonds together and place in a food processor bowl together with the chopped butter and the sugar. Pulse until all the ingredients are combined, but do not over process. Take about two thirds cup of the flour mix and place in a bowl with the dessicated coconut. Set aside. Add the eggs to the blender bowl, as well as the essence and mix for a few seconds. Using a spatula, spread this mix on the bottom of the prepared tray, levelling it with the spatula dipped in water if it is difficult to spread. 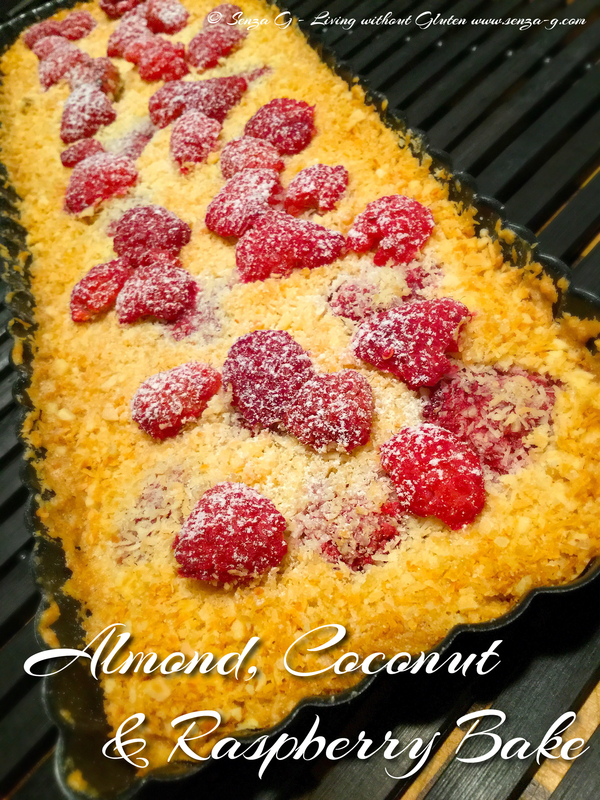 Scatter half of the raspberries on top and then sprinkle the top with the coconut mix. Place in the oven and bake for approximately three quarters of an hour. Take it out and place the remaining halved raspberries and put it back in the oven for about 15 to 20 minutes, after which leave to cool before slicing. Dust with icing sugar if desired.